[S182] Social Security Death Index (on-line), Ancestry.com, SSDI, Ancestry.com, SSAN 512-22-8472. Florence Peckham married Carl David Holcombe, son of Fort Erastus Holcombe and Dottie Ethel Butler. George M. Groendycke was the son of Asa Taft Groendycke and Louisa Currier. George Asa Messenger was born circa August 1834. He was the son of Adonijah Messenger and Rachel (?) 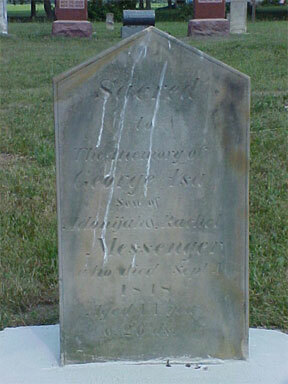 George Asa Messenger died on 4 September 1848. Paul E. Sage was born in 1892. He married Lura G. Rawson, daughter of Charles Rawson and Grace Holcombe. Paul E. Sage died in 1984. John Wolcott was born on 15 December 1696. He was the son of John Wolcott and Sarah Johnson. John Wolcott married Ann Sperry in 1722. John Wolcott died in 1743. Joseph Wolcott was born in 1728. He was the son of John Wolcott and Ann Sperry. Joseph Wolcott died in 1750. Mary (?) was born in June 1850 at PA.1 She married Frank F. Cartwright. Webster was elected Constable of the new township, Homer, Medina Co., OH, when it was organized in 1833. Webster and Abigail were enumerated in the 1850 Concord, Jefferson Co., WI, federal census. He was a farmer, age 53, she was 46. Children in the household were Flavil 19, Lucinda 16, Abigail 13, and Sophrona 10. Webster "Hokum" and Julia were enumerated in the 1860 Concord, Jefferson Co., WI, federal census. He was a farmer, age 62, she was 36. The only children in the household were Willis 4, and Adalaid Perkins 7. Willis Peck Holcombe was born on 22 September 1856 at Concord, Jefferson Co., WI.1 He was the son of Webster Holcombe and Julia Ann Brown.1 Willis Peck Holcombe married Edith Elizabeth Knapp on 18 September 1878 at Concord, Jefferson Co., WI. Willis Peck Holcombe died on 21 October 1933 at Beloit, Rock Co., WI, at age 77. Flavil Holcombe was born circa May 1831 at OH.1 He was the son of Webster Holcombe and Abigail Perkins.1 Flavil Holcombe died on 20 July 1854. Aaron Baker was born on 29 September 1837 at NY.1 He was the son of Thomas Baker and Mary Ann (?) Aaron Baker married Rosina Holcombe, daughter of Laomi Holcombe Jr. and Patience Pelton, on 4 June 1859 at Jefferson Co., WI. Howard and Catherine were enumerated in the Lorain, Lorain Co., OH, federal census. He was a fireman, age 36, she was 32. Children in the household were Viola 15, Theodore 13, and Daniel 8. Sarah Monroe was born on 15 May 1754 at Rehoboth, Bristol Co., MA. She married Amos Chafee on 22 February 1775 at Rehoboth, Bristol Co., MA. Sabra was eumerated in the 1850 Harrisville, Medina Co., OH, federal census, she was 39. Children in the household were Eugena H. 14, Wellington 12, Thompsn 10, Nahum 8, Benjamin 6, and Edson 1.